"I don't even know where to start..."
Feeling overwhelmed? Wondering if it's possible to move from "going crazy" to "in control" when you've got too many projects on your plate and too much mess in your relationships? You can simplify and savor your life-guilt free! Clutter, tasks, and relationships may overwhelm you now, but God can help you overcome with grace. 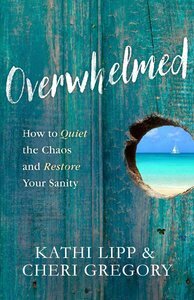 About "Overwhelmed: How to Quiet the Chaos and Restore Your Sanity"
Kathi Lipp is a busy conference and retreat speaker, currently speaking each year to thousands of women throughout the United States. She is the author of The Husband Project and The Marriage Project and has had articles published in several magazines, including Today's Christian Woman and Discipleship Journal. Kathi and her husband, Roger, live in California and are the parents of four teenagers and young adults. Cheri Gregory is a certified personality trainer and has written numerous magazine articles and drama scripts. When she's not writing, she loves to ride at the Monterey Bay Horsemanship and Therapeutic Center and to jog with her keeshond, Shatzi. She and her husband, Daniel, have been married for 25 years and are the parents of two young adults.